CHICAGO (CNS) — Over 5,000 people from Illinois, Wisconsin, Indiana and other Midwestern states gathered Jan. 14 in Federal Plaza in downtown Chicago for the annual March for Life Chicago commemorating the 45th anniversary of the U.S. Supreme Court decision legalizing abortion. Participants carried signs with pro-life messages and balloons during the rally and march through the streets of downtown. The drum line from Carmel Catholic High School in Mundelein played in the march. “The heavenly Father is smiling. Our Lady is smiling. It’s a great day,” she told the Chicago Catholic, the archdiocesan newspaper. Murrens said she brought her two teenagers because she felt it was important to expose them to the event and the message. Young people, especially in their teens, are impressionable and open to new things so that is a pivotal time to share the church’s teaching that life is sacred from the womb until natural death, the mother of three said. “This is when they see so much of what is going on in the world. This is the time when you can really grab their hearts and make a difference for the rest of their lives,” she said. The 1973 Roe v. Wade decision robbed the nation of its children and its dreams, he said. “Now with the recent law passed by our Legislature and signed by our governor, more lives and dreams will be robbed as will family incomes that will be forcibly used to pay for abortions,” Cardinal Cupich said referring to legislation Gov. Bruce Rauner signed into law in 2017 that provides state health insurance and Medicaid coverage for abortions. Other speakers at the rally included Illinois Congressmen Dan Lipinski and Peter Roskum and former Planned Parenthood director Ramona Trevino. Earlier in the day, Cardinal Cupich celebrated the archdiocesan Mass for Life at Holy Name Cathedral attended by a standing-room only crowd. During the Mass, young people brought white roses to the altar, commemorating lives lost to abortion and homicide in Chicago last year. In the Denver Archdiocese a day earlier, about 3,000 people gathered outside the state Capitol in Denver for the annual Colorado March for Life. The afternoon rally and march were preceded by the celebration of several morning Masses at a number of churches, including one celebrated by Denver Archbishop Samuel J. Aquila at the Cathedral Basilica of the Immaculate Conception. “This is the Colorado piece of the largest civil rights movement in our lifetime,” Lynn Grandon, archdiocesan Respect Life program director, said in advance of the Jan. 13 gathering. More pro-life marches were planned around the country. Among those will be the fourth annual OneLife LA Jan. 20 in Los Angeles, followed exactly a week later by Walk for Life West Coast in San Francisco. In Chicago, some of those who attended the Mass and rally also planned to travel to Washington for the national March for Life Jan. 19. 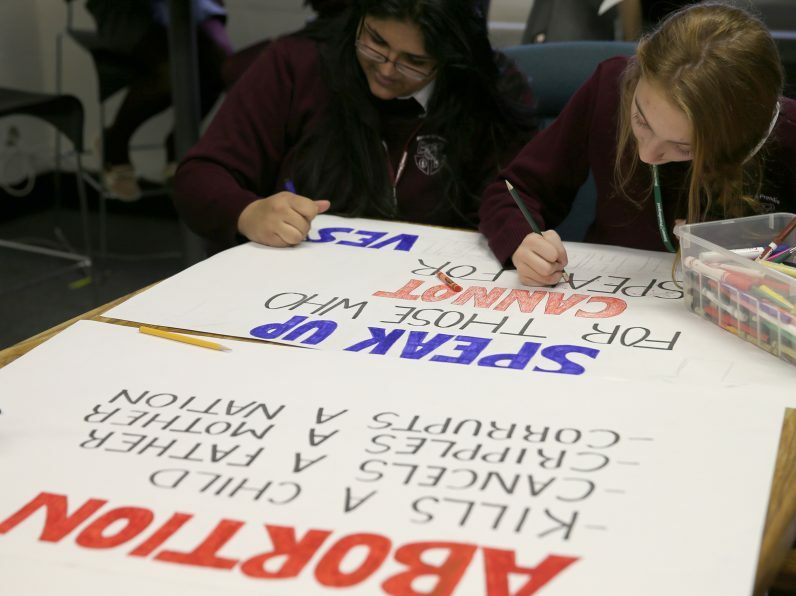 Others preparing to attend the march and rally in the nation’s capital included students at Monsignor Bonner Archbishop Prendergast Catholic High School in Drexel Hill, Pennsylvania, in the Archdiocese of Philadelphia. Catholic school leaders throughout the U.S. take thousands of their students to the regional or national March for Life events each year in an effort to engage them in the pro-life cause and to eventually pass the torch of leadership to them, said Steven Bozza, director of the Philadelphia archdiocesan Office for Life and Family. The pro-life activists who have been embroiled in the movement for decades will not be able to go on forever and it’s up to the current leaders to prepare the next generation of advocates, Bozza told Catholic News Service during an interview in Drexel Hill. Duriga is editor of the Chicago Catholic, newspaper of the Archdiocese of Chicago. Contributing to this story was Chaz Muth in Drexel Hill.